The court case against well known opposition activist Vladimir Kozlov and civil activists Serik Sapargali and Akjanat Aminov continues in Aktau (Kazakhstan). The case began on 16 August, with nine witnesses questioned between 16 and 21 August, however none of them confirmed the accusations of inciting social upheaval, calls for forced regime change and organisation of a crime gang. 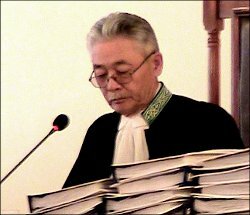 The case against the accused completes the chain of cases of the Zhanaozen riots of December 2011. In Kazakhstan, this is believed to be the first political court case. Witnesses say that Mr Kozlov, the leader of the opposition unregistered party “Alga!” had met oil workers, but nobody remembers him calling to bring down the constitutional order. KazMunaiGas HR department head Amantai Madinov remembers seeing Kozlov speaking on YouTube, but cannot recall what he was talking about. Oil workers’ strike activist Natalya Azhigaliyeva, another prosecution witness, accused two of her former comrades of inaction: she claimed that the opposition activists promised financial and legal help and negotiations, but reality this consisted only of trips and PR during the strikes. Ms Azhigaliyeva said that she did not see the leaflets on the bases of which the activists are accused of inciting social disunity, but she had heard of them. Burgilau employee Estai Karashev said that he met Kozlov once in 2010 and got 230,000 tenge from the opposition activist, in order for one of the oil workers to go to the opposition referendum. However, Karashev was beaten up and robbed the same day. Amengeldi Akashev, faculty member of the West Kazakhstan Institute of Psychology, conducted a psychological examination of the accused. He said that Serik Saparagli is “a loser” (because he did not become the boss) and is “pathologically stubborn” (because he participated in 11 protest actions.) The expert said that Vladimir Kozlov “did not have high intellectual potential” and a lack of “classical higher education”. Many observers believe that the results of the case have already been determined: Vladimir Kozlov will be found guilty of the Zhanaozen riots, and Sapargali and Aminov will escape with light punishments. Some Western politicians are beginning to voice their attitude to the court. Member of the European Parliament Marek Migalsky said that “the case against Vladimir Kozlov is politically motivated” and called for the campaign against Kozlov to be stopped and the case against him to be dropped. Who and what’s behind the riots in Kazakhstan?